When should you start the transfer? How do I transfer a *.uk domain away from DreamHost? Effective December 1, 2016, ICANN revised its Transfer Policy. Any change made to the registrant's name, organization, or email address will put the domain in a 60-day transfer lock; it will also trigger notification emails that are sent to the old and new registrant notifying them of the change. Before you initiate a transfer, be sure to opt out of the 60-day transfer lock using the panel. The following describes how to transfer your domain registration to another registrar. DreamHost recommends that you initiate the transfer a full week before the domain is set to expire. It can potentially take several days for the transfer to complete, so it's best to start the process as soon as possible before the registration expires. There are a few steps that you need to do before you submit the transfer request with your new registrar. This section is just an overview of steps. The full steps are shown below in the following sections. Unlock the domain registration for transfer in the panel at Registrations. Make sure a valid email address is set up as the ‘Registrant’ contact to receive any transfer approval emails. Finally, save your WHOIS changes. Obtain the auth code, which is also known as the EPP code from the panel on the Reg. Transfer page. You need this code in order to complete the transfer-in request at your new registrar. The domain registration being transferred must not be within 60 days of the original purchase or transfer due to ICANN restrictions. Your domain may be locked to prevent the transfer of it. If it is locked, you must unlock it before proceeding with the request for the transfer. The ‘Registration’ page shows the ‘Locked?’ column above. The status states ‘No’ or ‘Yes’. Clicking the word changes the status. In the image above, there is no need to change it because the domain is already unlocked for transfer. Once the domain is unlocked, you can move onto the next step to disable the privacy settings as well as verifying the current contact information. Your domain registration has a public WHOIS record. This record contains data about the domain (domain registration, DNS name servers, creation date, expiration date, and so on) as well as the contact information for the ownership of that domain name. Any email that is sent to the proxy email address is forwarded to the email address that you have setup as the Registrant email. This is the only address that receives the email through the proxy address. In the above example, there are three domain registrations on the account. 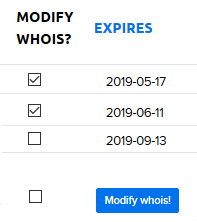 In the ‘Modify Whois?’ column, you can check the box for the domain you wish to modify, then click the Modify whois! button to continue. The modification page is listed in two sections: the first portion is the 'privacy' and 'Opt out' options for the domain. Privacy must be disabled (unchecked) to get the transfer-out processed smoothly. The privacy contact information never appears on this page. Instead, it appears on the public WHOIS lookup for the domain, but the modification page always includes the internal ownership details for the domain instead of DreamHost's privacy details. The tabs at the top allow you to edit each individual section with its own information in case you have different contact details for the Registrant, Admin, Technical, and Billing sections. Or, you can simply check the box for ‘Use this information for Registrant, Admin, Tech and Billing records’ so that all four fields are updated at once. The last tab at the top is for editing the domain’s nameservers in case you wish to point them elsewhere. However, this is not necessary for the transferring of the domain registration process. The most important information for the transfer-out of your domain registration is the ‘EMAIL’ field. Make sure you have a valid email address listed here so that any transfer approval emails are sent here to be verified. It’s also recommended to use an email NOT on your domain – for example an @gmail.com address – because in the event your domain expires, the DNS records for your email also do not function. If you’re using a third-party mail service, it's still able to receive the transfer email. Click the blue Continue button at the bottom once the privacy is disabled and the contact details verified. The third step to prepare your domain registration for transfer is the retrieval of your domain’s auth code (or EPP code). This code is what allows you to make the transfer request with the receiving registrar. Click the button under the Reveal Auth Code button for a domain. Depending on what type of Top Level Domain (TLD) you have, you are either able to reveal your auth code (EPP code) in the panel, or have it sent to the Registrant contact address (as specified by your WHOIS). When sending the EPP/Auth code through the 'Reg. Transfer' page, please make sure to check the junk/spam folder for the Admin contact email address you set for the registration. Domain registration transfers have to be initiated through the gaining registrar's interface. This is done after you’ve completed the preparation for the transfer. Each registrar has a different method for initiating domain registration transfers. If you're unsure of what to do, please contact your gaining registrar and ask them how you can initiate a domain transfer to them. Once you’ve completed the request for the transfer, you should expect to be notified to approve the incoming transfer with the new registrar (however they may process that request). An email for the release of the domain should be sent to your registrant contact for the domain registration. That email links you back to the panel at Reg. Transfer which allows you to click the Approve button to approve the release of the domain for transfer. The pending transfer shows in the ‘Transfer a domain registration away from DreamHost’ section’ of the ‘Reg. Transfer’ page. Once both the approval of the incoming transfer with the new registrar is completed and the approval for the release of the domain is confirmed with DreamHost, the transfer should complete within a few minutes to a few days. DreamHost does not have a status on outgoing domain registration transfers, and only provides a status for incoming transfers. If you need to know the status of the transfer-out, you must contact the registrar to which you’re transferring it. .uk domains do not have an EPP code. To transfer a *.uk domain that you own at DreamHost to another registrar, please ask your new registrar for their IPS tag. IPS tags are case-sensitive, and once an IPS tag is changed, it cannot be reversed. Once you obtain the new registrar’s IPS tag, log in to your DreamHost panel, and use the Contact Support page to contact a support representative. When submitting your request, make sure to clarify that the IPS tag on your domain needs to be changed for you. Article last updated April 10, 2019 18:53 PST.